The Denon DJ VL12 Prime sets the new bar position as the most superior turntablist technology available today. Featuring the most optimal acoustic isolation capabilities, able to handle any loud, bass-heavy environment, there's no classic or control vinyl-based gig the VL12 cannot handle. This true quartz locked, direct-drive Pro DJ Turntable offers you the most exhilarating 'hands-on' performance experience you could ever imagine. Visually stunning and customizable to your DJ branding preference, the VL12's platter light ring can be set to a multitude of colours, with adjustable brightness and a 'lights-out' mode too. The platter itself features an easy grip/brake, chamfered shape, so you can make the most direct and subtle adjustments to your vinyl mix. The VL12's beauty and elegance needs power to complete the circle; the VL12 Prime's adjustable, and 'highest in industry' torque ensures that your mixing, scratching and cutting experience on the VL12 is always solidly accurate, so your legacy is assured. You are defined as a DJ by your musical choices, your performance and your sound quality - the VL12 has your back on that, no questions asked, with an innovative isolated motor design resulting in the most optimal signal-to-noise ratio. The S-shaped tonearm is beautifully engineered for accuracy in tracking, sonic performance and ease of use, plus features a reinterpreted, dual function (lock/rest) support. Whether you play original vinyl, are a Club DJ, 'Battle-Style' Turntablist, or rock control vinyl in DVS mode, the Denon DJ VL12 shines above conventional OEM units, offering you the contemporary, next-level standard in legacy based performance DJ'ing. 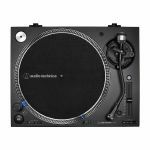 Notes: Numark recognizes your need for a professional turntable that capitalizes on the resurgent popularity of vinyl for DJ gigs. But we're mindful that you need for both versatility and value. The NTX1000 gives you everything you're looking for. It's a no-compromise direct-drive turntable that has all the features and performance demanded by you - the professional DJ. It has incredible start-up torque (4.0 kg), an S-shaped tonearm with height adjustment, damped cueing and anti-skate controls that ensure accurate tracking and precise song selection. You can customize your performance with an adjustable start/stop control. The variable pitch range of i 8, 16, and 50% enables you to create the perfect effect. Plus, the NTX1000's special isolation design easily resists feedback and external vibrations, even in the loud, bass-heavy environment where you perform, every night. Notes: The PLX-1000 is precision engineered for the booth, drawing on 50 years' experience of making high-end turntables. This high-torque direct drive turntable is equipped with a classic layout and a rubber-lined, S-shaped tone arm that improves isolation and prevents feedback. It is solidly built for excellent vibration damping and ultra-precise, high grade audio playback. Featuring next generation improvements, the PLX-1000 is the perfect score for professional DJs and vinyl enthusiasts. Combine this turntable with your Pioneer DJM mixer and get the ideal DJ system set-up. The high-torque direct drive makes sure that your tracks reach a rotation speed of 33? rpm in merely 0.3 seconds thanks to a starting torque of 4.5kg/cm (or more). On top of that it ensures stable rotation and exceptional control. For low impendance and amazing sound quality output, you can easily connect to the professional-grade, gold-plated RCA jacks. Ideal for a DJ on the road, the PLX-1000 has interchangeble power and audio cables. Unique to this turntable is the multi-pitch tempo control. Next to a standard variable width of i8%, you can also select a variable width from i16% and i50%. A simple reset button instantly reverts to the fixed rotation speed at i0%. Notes: Drawing on our heritage in making high-quality decks, the PLX-500 inherits the layout of the PLX-1000 professional turntable and produces warm, clear analogue sound. The high-torque deck is ideal for scratching and comes with everything you need including a cartridge, stylus and slipmat, and its USB out means you can easily make high-quality digital recordings of your vinyl collection in our free rekordbox software. You can use the PLX-500 and the rekordbox dvs Plus Pack to play and scratch digital files when you combine them with a compatible DJM mixer and the RB-VS1-K Control Vinyl. And you can choose between the black (PLX-500-K) and white (PLX-500-W) versions to match your set-up or the design of your home. Using its audio analysis technology, rekordbox detects the silence between tracks and creates a separate file in your collection for each one, so you can just press play and record a whole album from an analogue source to individual tracks without resetting the recording in between songs. After you've finished recording you can name and tag all your new tracks. - Connect the PLX-500 to your computer with a USB cable. - Open our free rekordbox application (version 4.2.1). - Click the record button in the software and it enters Record Standby mode. - Press play on the PLX-500. rekordbox begins recording when the music starts and ends when the track finishes. If you're recording several tracks, they will be automatically recorded separately. - When you've finished your recording session, press stop. A window opens in rekordbox where you can enter information for each track including name and artist. The tracks then appear in your rekordbox collection and you can search for them by name, artist etc. Buy the RB-VS1-K Control Vinyl from a Pioneer DJ authorised dealer .Visit rekordbox.com to download the latest version of rekordbox for free, then buy rekordbox dj (€139) and rekordbox dvs (€129) licence keys. Alternatively you can subscribe to rekordbox dj for €9.90 per month and get rekordbox dvs as part of your subscription plan. Find out more about rekordbox dvs. Notes: The RP-1000 MK2 is the ideal turntable for prospective DJs and HiFi enthusiasts. The MK2 version features several improvements, including a newly developed top panel construction and improved metallic buttons with enhanced feel. Unlike direct-drive turntables, the RP-1000 MK2 uses a belt-driven motor to de-couple the drive unit from the precision-engineered platter and chassis. The elastic, high-quality rubber belt absorbs and reduces unwanted vibrations, resulting in distortion-free playback. The adjustable pitch control with a range of +/-10 % is suitable for fine pitch adjustments. The RP-1000 MK2 features a statically balanced s-shaped tone arm with hydraulic lift and anti-skating mechanism. Thanks to the universal SME connection, a wide variety of pick-up cartridges can be connected. The new deep-black top panel is equipped with metallic buttons for start/stop and speed settings. The improved touch upon hit offers a clear haptic feedback. With the push of a button the aluminium target light can be extended, so that the needle position can be seen in dark surroundings. The sturdy construction with optimized damping features and shock-absorbing feet improve isolation from unwanted vibrations. The RP-1000 MK2 comes with the high-quality OM Black pick-up, handmade by Ortofon in Denmark, pre-fitted to a headshell ready for immediate playback. Notes: The RP-2000 MK2 is a dependable turntable for prospective DJs. The MK2 version features several improvements, including a newly developed top panel construction and improved metallic buttons with enhanced feel. Compared to belt-driven turntables, the RP-2000 MK2 transfers its motor force directly to the drive hub - this way a higher torque generates power faster on the precision-engineered platter with minimal wow and flutter. The adjustable pitch control with a range of +/- 8% is suitable for the finest pitch adjustments. Notes: The RP-2000 USB MK2 is a versatile turntable for prospective DJs. 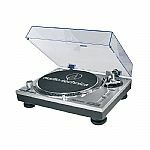 In addition to the built-in phono pre-amp the turntable offers a USB audio output for digitizing your vinyl. The MK2 version features several improvements, including a newly developed top panel construction and improved metallic buttons with enhanced feel. Compared to belt-driven turntables, the RP-2000 USB MK2 transfers its motor force directly to the drive hub - this way a higher torque generates power faster on the precision-engineered platter with minimal wow and flutter. The adjustable pitch control with a range of +/- 8 % is suitable for the finest pitch adjustments. Notes: The RP-4000 MK2 is a solid DJ turntable for advanced users. The new MK2 version comes with several improvements, including a newly developed top panel and reworked metallic buttons with enhanced feel as well as a variety of functions. Notes: With the RP-7000 MK2, Reloop has built a turntable that caters to the high demands of professional DJs and modern nightclubs. With its powerful direct drive motor and rugged construction we were able to develop a sturdy and indestructible turntable that can take on harsh everyday life with ease. By using a combination of metal, rubber and synthetic materials, the RP-7000 MK2's housing is more reinforced and heavy than ever before. This results in a turntable that is extremely resistant to vibrations that can be caused by heavy bass sounds in DJ booths and its shock-absorbing feet help to further improve isolation. The surface is coated with a scratch-resistant high-quality deep black or classic silver metallic finish. The RP-7000 MK2 features a statically balanced S-shaped tone arm with hydraulic lift and anti-skating mechanism. The newly developed tone arm base provides improved stability and adjustable height/vertical tracking angle (VTA). The low-resonance tone arm comes with a universal connection for pick-up cartridge systems (SME). As well as the above technical innovations, the RP-7000 MK2 is equipped with a few functions that will make any DJ's life much easier. The newly developed aluminium LED target light is freely moveable to help you find the stylus position in dark surroundings. The target light is also removable and easily exchanged. An additional start/stop button has also been integrated to facilitate a vertical setup (battle position) and by using the buttons on the RP-7000 MK2's top panel, you can switch between the three motor speeds (33 1/3, 45 & 78 rpm). Dedicated buttons for forward and reverse mode allow for further creativity in your mix. Using the high-resolution pitch fader you can adjust the platter speed in the classic turntable pitch range +/-8%. However, the RP-7000 MK2 is also cable of a wider, DJ-friendly +/- 16% pitch range and a massive +/-50% ultra-pitch. This allows for increased creativity when modulating the playing record's tone. If quartz lock is active, the platter speed will remain unaffected by the fader position and will spin at zero pitch (0%). Thanks to the recessed rear connection panel, the RP-7000 MK2 can easily be mounted in a flight case and seamlessly positioned next to other DJ gear. The switchable integrated phono pre-amp makes it is possible to use the gold-plated RCA connectors for both phono and line output signals. An optional ground terminal offers additional protection in club environments. All cable connections (RCA/mains) are detachable and easy to exchange, which also helps with transport and storage. The fine-tuned, quartz-driven motor with digital pitch correction operates at a starting torque of 2.8kg/cm, which can be adjusted up to a maximum of 4.5kg/cm. This makes it an extremely smooth running turntable with wow and flutter of just 0.01% WRMS*. Furthermore, the turntable break speed (platter stop) can be adjusted from 0.2 - 6 seconds and the precision-machined, heavy die-cast aluminium platter is lined with vibration reducing rubber to eliminate unwanted vibrations and resonance. With the RP-7000 MK2, Reloop has built a turntable that caters to the high demands of professional DJs and modern nightclubs. With its powerful direct drive motor and rugged construction we were able to develop a sturdy and indestructible turntable that can take on harsh everyday life with ease. Notes: Reloop are celebrating their 20th Anniversary with a strictly limited golden edition of the high-end DJ turntable, RP-7000. Limited to 1,000 pieces worldwide, the RP-7000 GLD will bear golden elements and an engraved plate with a unique serial number, making each turntable an exclusive collector's item. On top of that, this special edition is supplied with a golden headshell and a golden carbon fibre record cleaner out of the box. 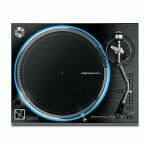 The Reloop RP-7000 is the solution for all vinyl DJs and DVS users who are looking for a professional high-torque, club-quality turntable with extremely strong motor and a sturdy and indestructible construction. With its high-quality, scratch-resistant finish, the RP-7000 is not only suited for your everyday club grind, it also looks extremely cool. On the technical side, the RP-7000 has also got a lot to offer: The highly dependable direct drive motor and premium speed controller with digital correction make this turntable reliable and precise device. More variety in the mix: With the reverse button and an adjustable stop time from 0.2 to 6 seconds, individual and creative impulses can be achieved with the RP-7000. As the turntable is equipped with a line/phono switch, it can also be connected directly to line inputs of mixers or amps with no need for external grounding. Notes: The most advanced DJ turntable ever made. Developed for application with Serato DJ Pro, and thanks to the seamless plug-and-play integration, the RP-8000 MK2 in a DVS setup offers unparalleled creative possibilities. The 8 large pads with RGB illumination can control over 7 different performance modes (Cue, Sampler, Saved Loops, Pitch Play, Loop, Loop Roll, Slicer), as well as 2 user modes, which can be custom assigned with individual preferred functions. Furthermore, by using the multi encoder it is possible to browse tracks directly from the turntable unit itself, and load them instantly to the respective deck. Thanks to its MIDI compatibility, the RP-8000 MK2 can communicate with every MIDI compatible DJ software - this way, an additional controller for performance modes is not necessary. The fine-tuned, quartz-driven motor with digital pitch correction operates at a starting torque of 2.8kg/cm, which can be adjusted up to a maximum of 4.5kg/cm. This makes the RP-8000 MK2 an extremely smooth running turntable. Also, the turntable break speed (platter stop) can be adjusted from 0.2 - 6 seconds and the precision-machined, heavy die-cast aluminium platter is lined with vibration-reducing rubber to eliminate unwanted vibrations and resonance. Notes: The T.92 M2 USB DJ Turntable is one of Stanton's newest additions. The T.92 M2 USB uses a direct-drive motor with a motor torque of 1.6kg and has built-in USB connectivity making it easier than ever to digitalise your beloved vinyl records. Features also include a key lock function, a pitch range of +/-12%, three playback speeds (33/45/78) and Quartz Lock. The new T.92 M2 aims to fit in effortlessly with any DJ setup and comes with a free full copy of Deckadance 2 DJ Software. Deckadance 2 is a powerful DJ application built for Stanton products, whether you're a professional DJ, remix/groove producer, mobile DJ or even just a bedroom DJ Deckadance 2 is flexible enough to suit any performance objectives. Not only is Deckadance 2 a standalone application but it can also run inside of your DAW with VST support as well as running VST compliant effects and soft synths inside Deckadance 2 giving you the capability to perform mind-blowing sets while being controlled by MIDI controllers, timecoded vinyl and CD systems. Deckadance 2 provides you with every tool you need to stand out above other DJs. 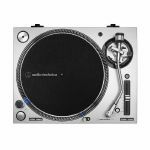 The T.92 M2 USB DJ Turntable is one of Stanton's newest additions. The T.92 M2 USB uses a direct-drive motor with a motor torque of 1.6kg and has built-in USB connectivity making it easier than ever to digitalise your beloved vinyl records. Features also include a key lock function, a pitch range of +/-12%, three playback speeds (33/45/78) and Quartz Lock. The new T.92 M2 aims to fit in effortlessly with any DJ setup and comes with a free full copy of Deckadance 2 DJ Software.